Join our effort to ensure ticket prices remain low and accessible to all. Any in-kind and cash donations help us achieve this commitment by underwriting hard costs of the event. Please consider making a donation to Empty Bowls Virginia Peninsula. 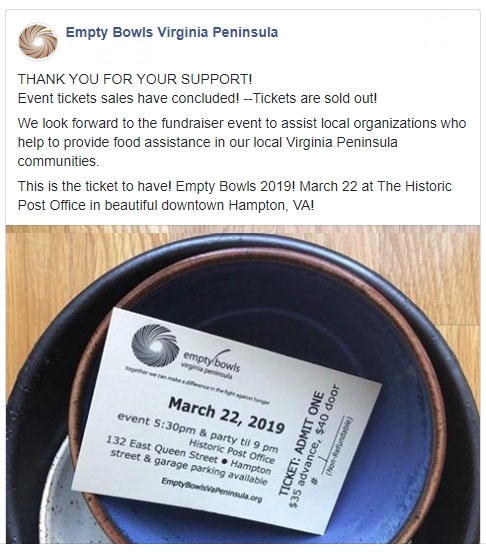 Mail Donations: Simply make your check payable to: Empty Bowls Virginia Peninsula. Credit Card or PayPal: Credit card donation will be processed via PayPal. Simply click on the button below and you wil be taken to PayPal to complete your on-line transaction. Other forms of donations (in-kind, service, materials); please use the contact form at the bottom of this page. Use the comment section to describe the type of donation you would like to make. and Thank You for helping feed the hunger in our community.